The Greek history of winegrowing began, so to speak, with an affair of the supreme god Zeus with the beautiful Seméle (daughter of Harmonia, goddess of concord), who gave birth to Dionysos the god of wine, joy, grapes, fertility and ecstasy. The antiquity Greece or on the basis of archaeological finds, especially the island Crete is considered one of the "cradles of European wine culture". Already in the Mycenaean culture in the 16th century BC (Mycenae = northeastern Peloponnese ) there was viticulture, whereupon found amphorae point out. Wine was an important part of the drinking culture of everyday life. The Greeks are among the very first, where wine as a valuable commodity acquired great importance. Already the poet Homer (8th century BC) reports in the Iliad of wine as a home drink of the heroes described. Furthermore, the historians dealt with wine and viticulture Hesiod (~ 750-680 BC), the philosopher Aristotle (384-322 BC), the naturalist Theophrastus (370-287 BC) and the doctor Galen (129-216). On their colonization moves in the Mediterranean, the Greeks brought their vines and viticulture culture after Sicily, after the as Oinotria designated southern Italy, southern France and the Black Sea. Many methods have been used by the Celts and Romans. The Roman poet Virgil described the variety of grape varieties: "It would be easier to count grains of sand in Greece than the different grape varieties." The famous port city Monemvasia on the peninsula Peloponnese was in the late Middle Ages under the rule of Venice a large-scale transshipment center for Sweet wines from the Aegean which were shipped from here to many countries in Europe. From the 15th to the mid-19th century, the Ottomans ruled the country, at that time lost by the Muslim alcohol ban the wine its meaning, only on most islands it was continued to a relatively small extent. Only a long time after the gained independence in 1830 and the pushing back of the Turkish influence, one began again to deal professionally with the viticulture as an economic factor and reactivated numerous vineyards. Amongst the pioneers were some Germans, such as Gustav Clauss, who in 1861 was the still existing huge cellar Achaia Clauss founded. By the end of the 19th century, the vineyard doubled, but when in 1898 the phylloxera finally reached Greece, many things were destroyed. The reconstruction was relatively slow, because in the meantime, the demand for Greek wine had declined sharply. 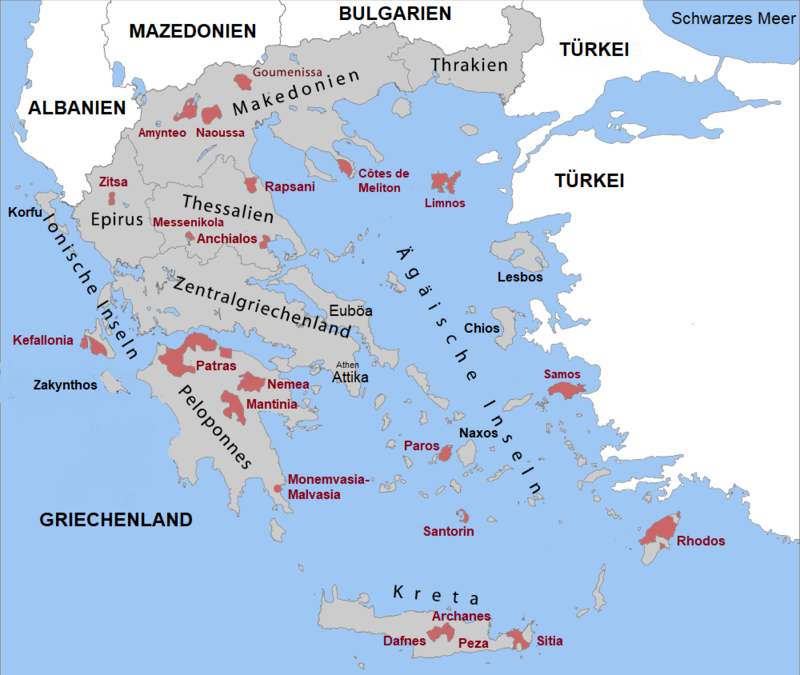 Greek winegrowing experienced a renaissance only with the end of the military dictatorship in the year 1974 and the accession of Greece to the European Union in 1981. Achladi White Perlina d'Inverno ? Agoumastos Mavro red Mavro Kalavritino ? Aïdani Aspro White Aïdani, Aïdani Lefko ? Aïdani Mavro red Mavraïdano ? Araklinos red Araclinos, Raklino ? Athiri Mavro red Mavratheri ? Gaidouria White Gaidouricha, Gaidouriha ? Kakotrygis White Kako Tryghi, Kakotrygis Kokkino ? Kartsiotis red Gouchevica, Kartsotes ? Katsakoulias red Gyftokoritho, Kaltsakouli ? Kolliniatiko red Bergiotiko, Eugeniko ? Korithi Aspro White Korithi Lefko, Korithi Leyko ? Koutsoumpeli White Koutsoubeli, Koutsoumbeli ? Mavro red Cipro Nero, Korithi Mavro, Kritiko Mavro ? Mavro Messenikola red Messenikola Mavro ? Mavroudi Arachovis red Arachovis ? Petrokoritho Red White Petrokoritho Mavro, Petrokoritho Lefko ? Petroulianos White Petrolanos, Petrolianos ? Platani White Platania, Platanos ? Potamissi Mavro red - ? Priknadi White Prekiadi, Prekna ? Psilomavro Kalavryton red Kalvritino ? Roditis Lefkos White Kolokythas Lefkos ? Sklava White Sklaba, slaves, slaves ? Skopelitiko red Scopelitico, Skopelitis ? Skylopnichtis red Kasteliotiko, Mavros Arcadia ? Sykiotis red Chiotis, Kiotes, Kiotis ? Syriki red Kseriki, Seriki, Syrike, Xerichi ? Tachtas White Kourou Tachtas, Kour-Tachtas ? Theiako Mavro red - ? Tourkopoula White Rhoditis Kokkinos, Roditis Kokkinos ? Vaftra red Vaphtra, Vautra, Vavtra ? Vidiano White Abidano, Abidiano, Abudiano ? Vlachiko red Blachiko, Blachos, Vlahico ? Voudomato red Voidomata, Voidomati, Voidomatis ? Vradiano red Bradyano, Vradinia ? Xeromacherouda red Xeromachairouda, Xeromacheirouda ? The preference for resinated wine, especially the Retsina With around 10% of the wine production, is an ancient Greek tradition. On almost all Aegean islands sweet, partially fortified dessert wines are produced, the best known is probably the Samos from the island of the same name. Also well known are the flavored with anise liquor ouzo, as well as the brandy flavored with herbs in a secret mixture (including rose petals) Metaxa, Important producers are Achaia Clauss. Biblia Chora. Boutari. Calligas. Cambas. Domaine Carras. Gaia. Hatzimichalis. Katsaros. Kechri. Kourtakis. Malamatina. Mercouri. Oenoforos. Papaïoannou. Parparoussis. Pavlidis. Skouras. Spiropoulos. Tsantali and Tselepos, Others are listed in the sections. Following the French example, from 1971 to 1972, the Ministry of Agriculture introduced controlled designations of origin for the best growing areas: maximum yields per hectare, certain varieties with preference for autochthonous Varieties, minimum must weight, aging regulations and sensory Exams. On enrich Of the must with sugar is generally allowed, but may increase the alcohol content by a maximum of 2.5% vol. A sweetening may be added before and during fermentation to a maximum of 25% of the sugar contained in the must. Also one leavening is allowed and is often practiced because of the rather low-acidity of the grapes. Controls are exercised by the KEPO (Central Committee for the Protection of Wine Production). Oinos / Οίνος : wines without a denomination of origin. This lowest quality level is mostly blends from different growing areas. PGE / ΠΓΈ (Prostatevomenis Geografikis Endixis / Προστατευόμενης Γεωγραφικής Ένδειξης) : A country wine with protected geographical indication. There are around 80 rural wine areas that can span an entire region, district or municipality. One of the most famous areas is Agioritikos on the "Holy Mountain" Athos (Chalkidiki Peninsula). POP / ΠOΠ (Prostatevomenis Onomasías Proelefsis / Προστατευόμενης Ονομασίας Προέλευσης) : A quality wine with a protected designation of origin. Alternatively, however, the old names or quality levels OPAP, OPE and OKP are possible. OPAP / ΟΠΑΠ (Onomasía Proelefséos Anotéras Piótitos / Ονομασία Προελεύσεως Ανωτέρας Ποιότητος) : For these quality wines with the " denomination of origin of higher quality" maximum yield, minimum alcohol content, maturing time in cask and bottle etc. are required. The OPAP wines were up to the year 2015 with a red banderole characterized. OPE / ΟΠΕ (Onomasía Proelefséos Eleghoméni / Ονομασία Προελεύσεως Ελεγχόμενη) : These quality wines with "controlled designation of origin" are subject to the same conditions as OPAP wines. In addition, however, there are higher requirements in terms of sugar content, This is Sweet wines from the historical areas Kefallonia. Limnos. Patras. Rhodes and Samos declared. Either they are "natural sweet wines" fortified with wine spirit or pressed from dried grapes " natural sweet Wines, "one of them Trockenbeerenauslese correspond. The OPE wines were marked up to the year 2015 with a blue banderole. Kava (cava) : name (ie cellar or, appropriately, "encased") for a longer-stored wine of the highest quality. White wines must be stored for two years (at least 6 months in barrel and six months in bottle), red wines must be stored for three years (at least 6 months in new oak or 1 year in used oak and 2 years in bottle). Reserve (Epilegmenos) and Grande Reserve (Idika Epilegmenos) : Only allowed for quality wines (OPAP and OPE). Reserve is valid for white wines with two years (for 6 months in barrel and 6 months in bottle) and for reds with three years of storage (same minimum). Grande Reserve is valid for white wines of at least three years (for 1 year in barrel and 1 year in bottle) and for red wines with at least four years of storage (for 2 years in barrel and 2 years in bottle).